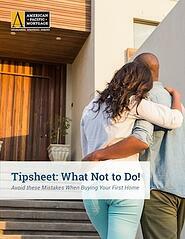 Tipsheet: What Not to do! When you’re ready to buy your first home, what you don’t know could be the difference between a smooth path to the finish line or a rocky journey. Download our Tipsheet and you can steer clear of the most common hurdles along your path to homeownership.